Civil War Timeline, Civil War Timeline 1865 including battles. Civil War Timeline 1865 ..the final year of the Civil War. January 15,1865..Wilmington, N.Carolina, a haven for CSA blockade runners is captured by Admiral David Porter and a ground force under Union General Alfred Terry capture Fort Fisher. January 31,1865.. The Thirteenth Amendment abolishing slavery is passed by Congress. February 3,1865...President Lincoln meets with CSA Vice President Alexander Stephens to discuss the possibilities of peace. The meeting was stated “informal” without records, as these two former Congressmen and Whigs find no middle ground. 1) Restoration of the National Authority throughout all states. 2) No receding of the slavery question. 3) No cessation of hostilities except a complete end of war, and disbanding of all forces hostile to the Federal government. February 15,1865…Sherman turns his army north to destroy the Carolinas, burning Columbia, S.Carolina to the ground. March 4,1865…President Lincoln is inaugurated for his second term. March 25,1865…Fall of Petersburg,Virginia as General Grant withstands the last attacks from the Confederates as he is dug in around the city. Lee’s last attack comes on April 1, than he retreats. April 2,1865…General Grant has captured Petersburg and advances toward Appomatox while Lee also abandons Richmond. Confederate General A.P. Hill ( “Little Powell”) is killed at Petersburg,Virginia just seven days before Lee’s surrender. April 4,1865…President Lincoln tours Richmond. He will sit in President Davis’ office chair while visiting the CSA White House. April 9,1865…Confederate General R.E.Lee surrenders to Union Lieutenant General Ulysses S. Grant at Appomatox after losing a final battle that morning at Appomatox Courthouse. 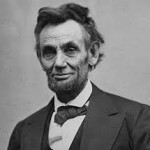 April 15,1865…President Abraham Lincoln dies at 7:22am after being shot the evening before at Fords’ Theater in Washington. The assassin is well known actor and Southern sympythizer John Wilkes Booth who has escaped. April 26,1865…Confederate General Joseph Johnston surrenders his Army of Tennessee to Union General William T. Sherman in Durham, N.Carolina after 3 days of negotiations. Assassin John Wilkes Booth is finally located, shot and killed. May 10,1865…Former CSA President Jefferson Davis is captured in Irwinville, Georgia. June 2,1865…Confederate General E.Kirby Smith, commander of the Trans-Mississippi Department of the Confederacy signs surrender terms offered by the Union Army after 3 days of negotiations at Galveston,Texas.